Navigating a modern musical landscape littered with the detritus of bland forgettable songs with plastic production, many of us yearn to return to 1970’s reggae when musicality reigned and experts were at the controls. Take heart, a new release has recalibrated the standard for reggae recordings! If you seek timeless reggae with depth and breadth, add Archives to your collection. The Archives’ self titled CD is a masterpiece of roots rock reggae. A stunning accomplishment for a first release, the album was collectively written and arranged by a working band. Synthesizing inspiration from reggae’s zenith, the Archives have surpassed emulation, hewing unique and engaging contours into the roots-rock. The Archives pay homage to Bob Marley, Peter Tosh, Beres Hammond, Augustus Pablo, The Skalalites, Black Uhuru, and Steel Pulse, but fashion an utterly original identity. The Archives smelt many elements from reggae’s periodic table into a new sonic alloy, fusing hints of dancehall, ska, r&b, funk and even Latin rock into the mix. Archives is a musically sophisticated album crafted by seasoned masters: a beacon of knowledge, talent, vision and execution. Writing includes dramatic keys, climatic bridges, and lyrics that are simultaneously memorable and yet poetically oblique enough to inspire meditation. The Archives have crafted luminous compositions that will find permanent rotation on your MP3 player, and your subconscious playlist. 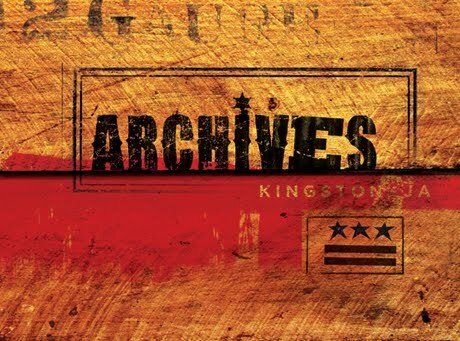 Formed with the intention of exploring the origins of reggae, Archives are a first-class unit assembled by consummate keyboardist/director Daryl “D-Trane” Burke [Eek-A-Mouse, Gregory Isaacs]. Vocalist Ras Puma [Thievery Corporation], persuades with flinty wisdom, or employs spellbinding, propulsive, syncopated, melodic toasting to convey his message. Crooner Lenny Kurlou [S.T.O.R.M. ], charms with a tone as sweet as Beres, enlightening as he mesmerizes. Drummer Leslie “Black Seed” James, Jr. [Culture, Eek-A-Mouse], lays pristine one-drop, steppers, and rockers riddims to anchor the Archives, and stimulates through tension and release. Bassist Justin “Relentless” Parrott’s [Claudius Linton] subsonic bass lines surge from a deep pocket, radiating haunting sub-melodies. Guitarist Mateo Monk lures listeners with driving skanks, enthralling staccato melodies, Marley-worthy solos, and proffers ethereal contributions on flute and melodica. Guided by the steady hand producer Eric Hilton [Thievery Corporation], dynamic arrangements ebb and swell, live instruments resonate naturally, and production is organic and elegant with intermittent dub effects. The album benefits from guest appearances by Desi Hyson [Culture, The Original Wailers] on organ, full horn sections including Craig Considine [Chopteeth, Busta Rhymes], and tasteful percussionist Jeff Franca [Thievery Corporation]. Lyric themes are familiar rasta territory (condemning Babylon, greed, posers, colonial theft, and religious bigotry; and promoting rasta livity, herb, reggae music, worthy raisons d'être, and the spiritual nature of music), but approached in a compelling figurative manner. I can’t stop singing & humming Archives songs. Crucial album. Do yourself a favor and join the Archives massive! 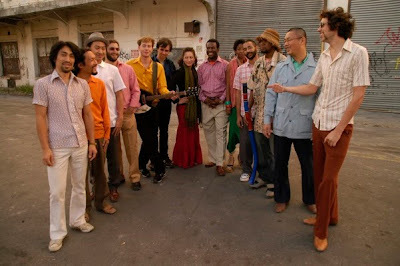 Akoya Afrobeat is one of New York’s most original and longest running Afrobeat Bands. Started in 2002, Akoya has grown into a 14-piece multicultural Afrobeat Ensemble that includes musicians from Nigeria, Benin, South Africa, Botswana, Japan and the United States. The Akoya ranks are filled with some of New York’s finest musicians who have performed with Fela’s Egypt 80 Band, Fela! the Musical, Antibalas, Arcade Fire and Zozo Afrobeat, to name a few. Akoya’s first two records, “Introducing the Akoya Afrobeat Ensemble” and “PDP,” have been distributed in the US, Japan and Europe on both vinyl and CD. 2005′s “Introducing…” was met with critical acclaim, and Akoya quickly gained the reputation of being one of the strongest new Afrobeat bands on the global scene. You can support their independent recording effort through Kickstarter, and be the first to own a digital copy of the new recording, or an autographed vinyl record, or lots of other goodies. Support independent music and help keep afrobeat strong by supporting Akoya Afrobeat! Last year, Ghanain jazz-funk pioneer Ebo Taylor put out his first recording in more than 30 years, Love and Death, a remake of the1980 release "Conflict." That was great news for afrobeat fans around the world, as Taylor was a key figure in the fervent West African music scene in the early 1970s. Originally trained as a jazz musician, he was part of highlife bands the Stargazers and the Broadway Dance Band in the 1950s. He led the Black Star Highlife Band in the 1960s before collaborating on some of the signature afrofunk tracks of the new era. As a guitarist, composer, arranger, bandleader and producer he helped bridge the gap between traditional Ghanain forms, jazz and funk, working with Fela Kuti, the Apagaya Show Band, the Uhuru Dance Orchestra and others. With Taylor's new release Appia Kwa Bridge from Strut Records, he has come full circle, and now leads a new generation of afrobeat musicians from Berlin-based Afrobeat Academy. The result are some rich, pounding grooves that make your heart beat faster and your feet move quicker. The recordings also feature the one and only Tony Allen in a guest spot on drums, as well as original Africa 70 guitarist Oghene Kologbo. 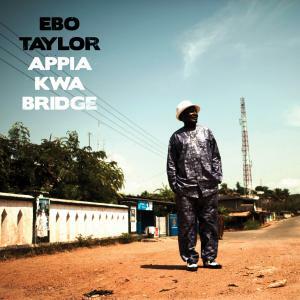 ‘Appia Kwa Bridge’, released this April, is a strident return from the Ghanaian highlife guitar legend. Featuring six new compositions, his sound is more dense and tightly locked than ever with Berlin-based musicians Afrobeat Academy, a rock solid unit since regular touring worldwide following his ‘Love And Death’ album in 2010, including a string of dates for WOMAD. Jochen Stroh works his analogue magic once more from his base at Berlin’s Lovelite Studios. The album covers a variety of themes dear to Taylor. The title track references a small bridge in Ebo’s hometown of Saltpond on the Cape Coast: “it is a tiny bridge but a place known in the town where people meet, where lovers get together.” The firing, rousing ‘Ayesama’, first demo-ed during the ‘Love And Death’ sessions, is a Fante war cry, a taunt – “what’s your mother’s name?”; ‘Nsu Na Kwan’, based on a Fante proverb, asks “Which is older – the river or the old road” with the sub-text to respect your elders and the brilliant ‘Abonsam’ carries the message that Abonsam (The Devil) is responsible for evil in the world and that we should follow the Christian message. Soundway are proud to release the debut album of Portuguese/Angolan DJ Mpula aka Pedro Coquenão. 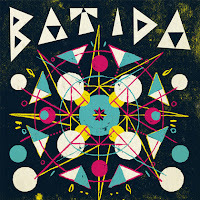 A distinctly modern and vibrant project with its feet firmly rooted in the past, Batida combine samples from old 1970s Angolan tracks with modern electronic dance music. 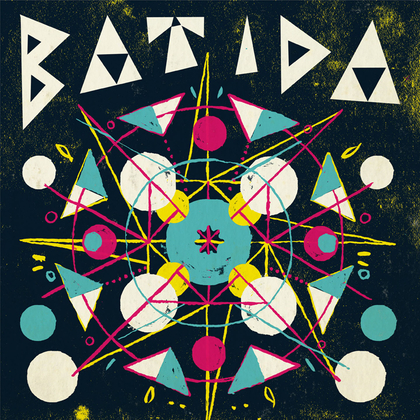 Simply put, Batida is the sound of the wildest Angolan street party. Being the first of a string of brand new projects, this eponymous first album sees Soundway taking a slightly different direction in 2012 and beyond. Championed mostly for their work in un-earthing and re-releasing classic, rare and vintage tropical recordings, Soundway have started signing new acts that have drawn on and been inspired by the kind of music found on the label’s groundbreaking compilations and re-issues. What originally started out as a radio show designed to promote new African music has slowly evolved into a collaborative project crossing continents. Music is the starting point but through dance, graphics, photography, radio and video, Batida expands, taking in politics and social commentary but always bringing it back to the party. 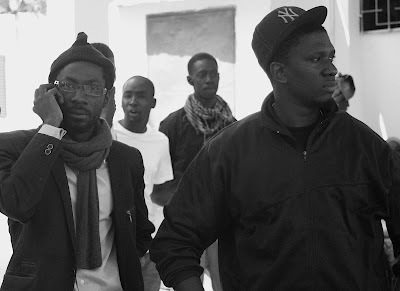 Batida’s high energy live show features dancers, percussionists, DJs, MCs alongside visuals and images (both archive and new) of Angolan streets, war and fragments of tribal life. Batida will be making their first live performance of the year at this years Eurosonic festival in The Netherlands. …The country found itself in the grips of protests and riots last summer that extended into recent weeks before the election where six or more people were killed. Reportedly leading these protests, sans the riots, are M23, a composition of civil society groups, ordinary citizens and opposition parties that arose from an uprising on June 23, 2011 protesting against a constitutional makeover by President Wade, and Y’en A Marre (French slang for "fed up"), a group of citizens including youths and artistes fronting for the frustrations of society at large. ..
What do you get when you put together afrobeat legend Fela Kuti and rap pioneers De La Soul? 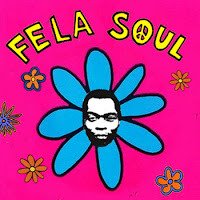 You get Fela Soul, a musical tapestry created by Gummy Soul artist Amerigo Gazaway. More than just a clever title, Fela Soul is an 8-track, 33 minute journey into the world of afrobeat rhythms, funky horn riffs, and classic hip-hop gems. Using dozens of hand-picked samples from the Nigerian instrumentalist and political figure Fela Kuti, and 8 carefully-chosen acapellas from the Native Tongue rap trio De La Soul, Amerigo seamlessly intertwines the two into something completely new and original. 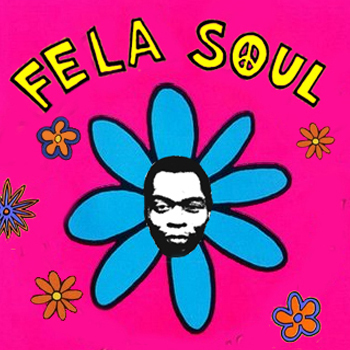 Fela Soul is the sort of mash-up album that never gets tired. 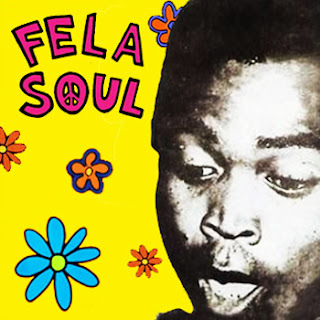 The concept is fresh and simple: Take the music of Afrobeat legend Fela Kuti and marry it with the raps of De La Soul. Fela Soul is the work of Gummy Soul producer Amerigo Gazaway, who makes his ingredients sound as if they were born to be together. (There's also an instrumental version of the album that you can also download for free.) Nashville's Gummy Soul, a boutique soul and hip-hop label, was founded by Walter Clark and started as a radio show on Vanderbilt's WRVU. 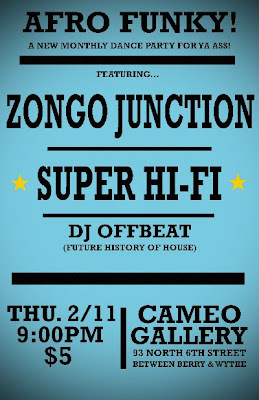 Hat tip to Marc Gabriel Amigone of the always up-to-date Afrobeat Blog for the heads up. 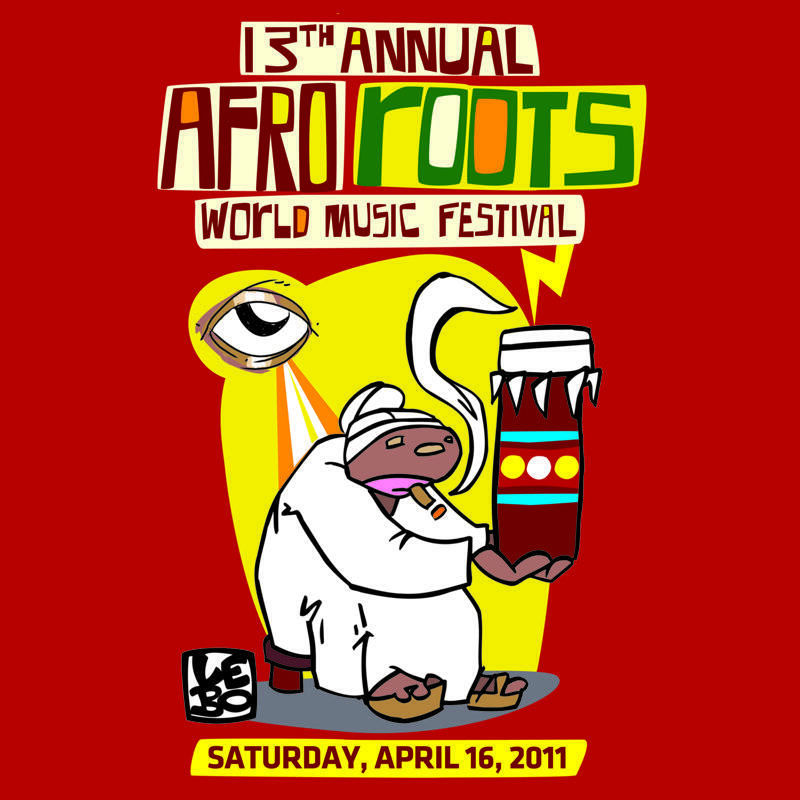 One of the most exciting world music events of the year will be in Miami on April 16th: the 13th Annual Afro Roots World Music Festival. The festival will feature the Haitian Rara & Caribbean sounds of Boukman Eksperyans; Locos Por Juana with Special Guest Rocky Dawuni; The Spam Allstars with Special Guest Papa Malick Faye; and Jahfe plus DJ Moses and live painting by Lebo. That's a dynamite lineup. For more than a decade this festival has been one of the premier world music events in the US, with a special emphasis on cutting-edge African and Caribbean sounds. A definite must-see if you live in the area, and a great excuse to head to Miami if you don't. Download or listen to some special free sample tracks from Locos Por Juana ("AfroSound"), Rocky Dawuni ("Download the Revolution"), The Spam Allstars ("Agua de Poco") and Jahfe ("Solution"). 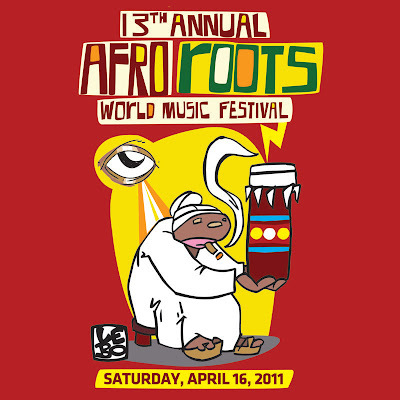 Community Arts and Culture presents the 13th Annual Afro Roots World Music Festival, Celebrating 13 years of serving Miami Dade County with quality programs, this festival has been noted by some as the longest running world music festival in Miami. The festival has been able to expand its reach beyond local South Florida artists by bringing in performers from African countries such as Senegal, Ivory Coast, Guinea, Mali, and the Republic of Congo. This global connection through music has helped the festival evolve into one of Miami’s most culturally diverse events. On Saturday The Afro Roots World Music Festival main event will include the high energy sounds of Grammy Nominated group Boukman Eksperyans fusing traditional Haitian and Caribbean rhythms with rock and reggae. 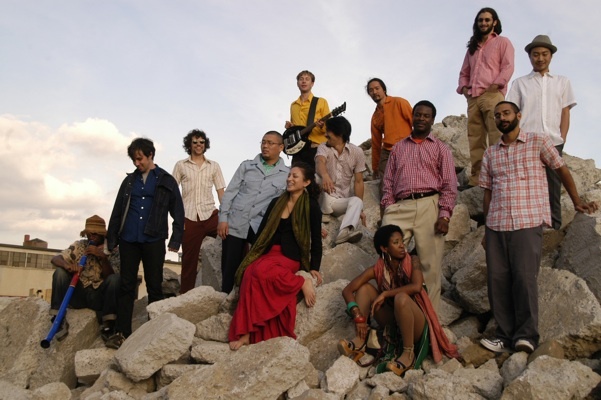 Also featured are Miami’s beloved Latin Urban Orchestra, Locos Por Juana who will be joined on stage by Ghana’s international music star, Rocky Dawuni. Also performing are the Spam Allstars who’s blend of Electro Descarga will be joined by the sounds of Senegalese Percussion Master Papa Malick Faye. Finally, kicking things off this year is Jahfe , an act that fuses roots reggae with many other genres including rock, dub, soul and R&B, creating a unique blend of organic sounds. World renowned painter and Miami native, LEBO, will be painting live to the music, and DJ MOSES will be spinning the sounds of the world in between sets. Ladysmith Black Mambazo in DC! Legendary South African choir Ladysmith Black Mambazo comes to Washington, DC's Lisner Auditorium on Thursday, March 10th. Ladysmith Black Mambazo create a joy-infused environment everywhere they sing the complex and harmonious songs developing out of the South African Isicathamiya tradition. The Grammy-Winning all-male choir, launched to international fame by Paul Simon's Graceland, has married the intricate rhythms and harmonies of their native South African musical traditions to the sounds and sentiments of Christian gospel music for more than forty years. Lisner Auditorium, 21st and H Streets NW, Washington DC. "The voices ... share deep, resonant chords, hummed or shouted or swooped, in joyous crescendos or a velvety hush; they answer gentle exhortations from Ladysmith's leader or propel his solos with rhythmic riffs, or sing along behind him with rich unanimity. Onstage, the group matches its harmonies with dance steps, kicking and soft-shoeing." 1978 was a year full of historically significant events in the turbulent life of Fela Anikulapo Kuti. Fela was not performing locally, the Nigerian government had banned Fela shows for a year, and neighboring Ghana kicked him out after protestors adopted Fela’s “Zombie” in anti-government protests. February, in anti-colonial cultural protest, he married 27 wives (his “Queens”) in Lagos. He and his republic staged a 78-day sit-in protest in the Decca Record company Lagos headquarters for breach of contract and royalty disagreements (Fela’s show in Berlin is the only reason they left). In April, Fela’s mother died of injuries she sustained during a government raid on Fela’s Kalakuta compound. In November (or September according to some sources), Fela & Afrika 70 headlined the Berlin Jazz Festival, while back home in Nigeria, government forces demolished the Kalakuta compound. 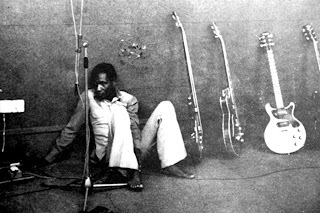 Shortly thereafter, Afrika 70 disbanded, after Fela’s longtime musical director/drummer Tony Allen quit, reportedly due to pay, autonomy, and respect issues (for example, Fela decided to use the Berlin Jazz money to fund his presidential campaign). Fela’s baritone saxophonist, Lenkan Animashaun (a.k.a. 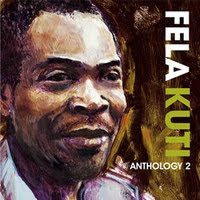 Baba Ani) assumed the duties of musical director of Fela's new Egypt 80 band. Berlin Jazz 1978 was a landmark concert for Fela: a rare, high-quality, professionally recorded document of Afrika 70’s final show! The venue is in the round, and although there are few camera angles, close-ups and smart democratic focus on most band members is satisfying (though Allen is not covered quite as much as his importance commands). 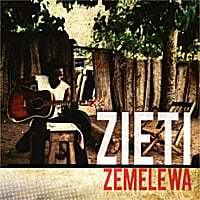 Songs are true Afrobeat length (approximately 15 minutes each). Solos are as strong as ever, this is Afrika 70 at their apex. Musically, the band is tight, vocals are solidly accurate, and the groove is a stunning demonstration of the highest level of musicianship, control, and stage presence. The band is animated, engaging, and amusing (guitarists Kologbo & Shegun, and the percussionist Abayomi brothers are particularly entertaining). Dynamics are extreme and hits are thrillingly precise. The polyrhythmic percussion propels with bubbling tension and release, and contains the sonic interest of woody melodic gbedu (akuba). In light of the band's brilliance and infectious energy, it is puzzling and vexing that the live audience does not react much. They do not stand, nor dance, mostly sitting watching, stroking their beards, exclaiming, "hmmm, indeed." Odd. The video and audio quality is the best I have ever seen for a Fela concert. The mix is remarkable for the era and enormity of the band. The video is crisp and well lit, with white stage lights always on. Not particularly mood-inducing, but perfect to witness Afrika 70's band members playing, who are too often buried in the murky darkness. The band is perfectly tailored in bright yellow, with the chorus members donning complimentary purple. Fela is stunning in a yellow/dark blue brocaded jumpsuit. 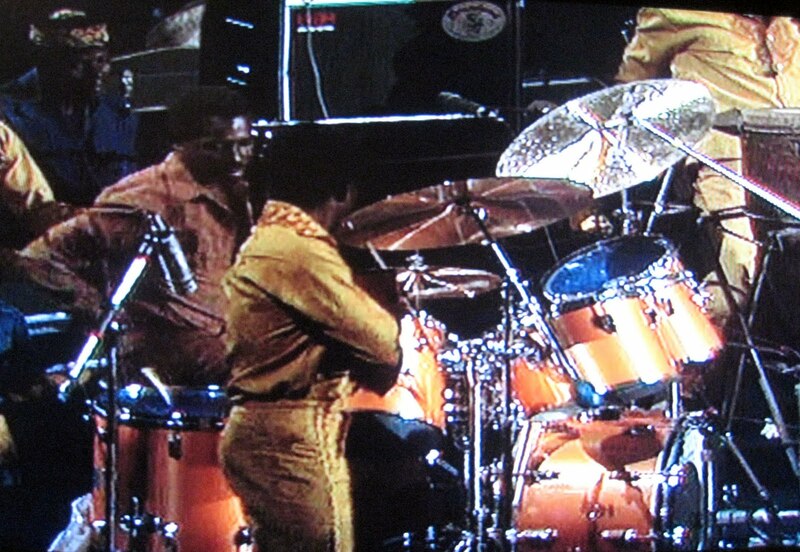 Tony Allen plays an uncharacteristically large single-headed Rogers drum set, with dark Evans Hydraulic drumheads. Tunde (Baba Tunde) Williams- Trumpet. Fela introduces V.I.P., “Look at me as something new, something you have never seen before...99.9% of the information you get about Africa in wrong...V.I.P.means ‘Very Important Personality’...but you see, when these VIP get too rich, they do not want to see the ordinary man on the street who is poor.” Fela chastises audience members for talking while he is introducing the song. Introduction- “I am going to stand for presidency of my country next year... Somebody ask me, ‘how can a musician be a president’, and I ask him how can a lawyer be a politician?... 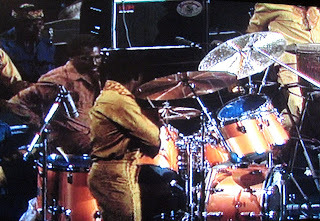 The big man, like to use power to strike you down... the African concept of music, where jazz originated...” This performance is quite a rollicking rock version. Introduction- “You see when you are a revolutionary and you talk the truth... people will come and slap you down... then you talk again, they put you in jail... and when you are very strong, and you talk again, they may kill you, they may even burn your house down.... African people are afraid for life... they say, ‘do not talk again’.... but they no hear at all, they going to hear Pansa Pansa (more and more...) because the truth can never die”. Pansa Pansa is a wicked fast Afrobeat groove. The bass guitar is a little low in the mix here- crank your bass settings for maximum funk. Watch for the percussionist helping the guitarist adjust his settings mid song! Pansa Pansa recounts some of Fela’s revolutionary hits, then directs some audience participation. Look for Fela’s organ solo surrounded by his percussionists and guitarists striking photogenic poses around him. Cross Examination imagines putting the "African colonial soldier" on trial (Nkruma as judge, Fela as prosecutor, JK Braimah as defense). **Cross Examination contains extended masterful solo work by drummer Tony Allen- leading Fela’s wives/ dancers in provocative displays! “I am the ambassador for Timbuktu” reveals Khaira Arby on an NPR interview. A relative star by her teenage years, Khaira Arby is a modern force for the bestowment of Malian traditional music with a modern sensibility. Inspired and mentored by her cousin Ali Farka Toure, whom Khaira sang with in her twenties, Khaira is advancing the reach of Malian music, as well as evolving the fusion of Malian and American music. An unreleased recording from the era of their collaboration in the mid eighties can be found at the amazing blog site http://blogs.voanews.com/african-music-treasures/music/, along with a wealth of other fantastic recordings. 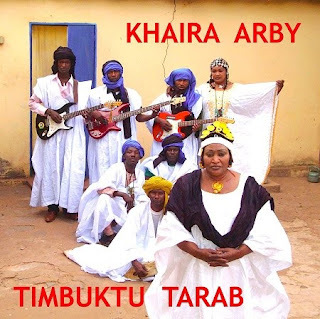 Timbuktu Tarab, is Khaira Arby’s most recent and international album. Released in August of 2010, it features a host of fine musicians, naturally including her band, which is comprised of fairly young and even some familial talent from Timbuktu who play with a fiery urgency. Instruments featured include the modern electric band outfit, but also features a nice mix of ngoni, njarka, sokou, and calabash. The album finds Khaira singing in several languages indigenous to this Saharan region of Africa: Songhai, Tamaschek, Bambara, and Arabic. Although modern character and inevitably, production are evident throughout, of special significance is the song Tarab. After a profound musical encounter on a rooftop in Timbuktu, the band Sway Machine and Khaira Arby have made a bridge of communality, resulting in rewarding proliferation. Sway Machine is fronted by New York’s Jeremiah Lockwood, who has explored the musical revelations of his Jewish background, of blues, and other music in Balkan Beat Box. His partners include musicians from Barbez, Arcade Fire, and Antibalas. Khaira Arby and Sway Machinery have appeared at the Festival of the Desert 2010, and have appeared together in a live setting several times. 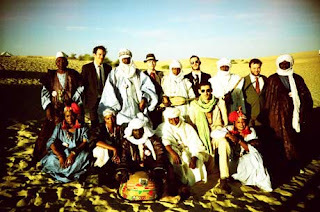 Timbuktu Tarab, is quite effectively a great album. Go check it out and be prepared to experience the sweet riffs and vocal command of Tarab. This song just Kicks It! See FELA! The Musical (London) in Movie Theaters! For those unfortunate souls who missed the run of “FELA! 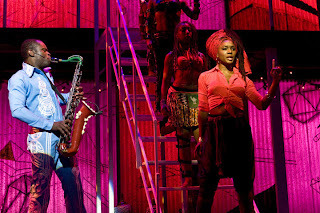 The Musical” on or off broadway, we have wonderful news: The London run of “FELA! The Musical” will broadcast via theaters , late January, 2011. For a full list of participating locations and ticket information visit” HERE. FELA on Broadway no get enemy. In fact it has the enthusiastic support of the popular masses, and now official recognition from the Tony Awards. The ultimate Fela tribute band (a.k.a. 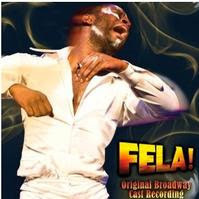 “FELA!” on Broadway) will release a CD June 8, 2010. Performed by members of Antibalas afrobeat band, with Sierra Leone’s Sahr Ngaujah on lead vocals this album is sure to be an afrobeat classic. 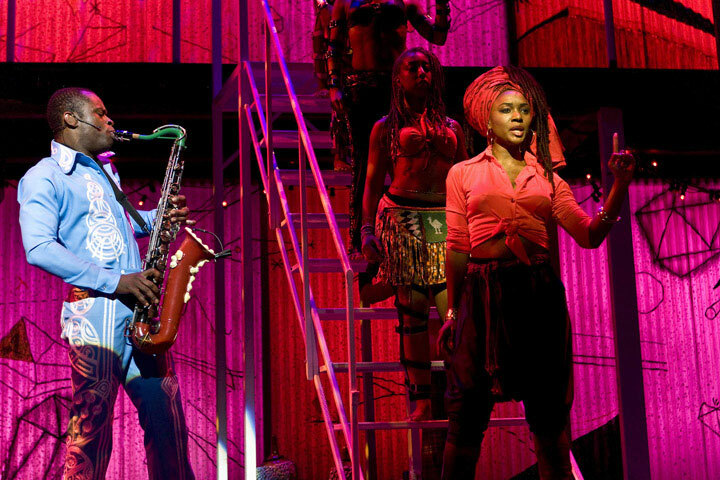 Broadwayworld.com rates the forthcoming original cast recording of the afrobeat musical 9.5 out of 10 stars. Produced by Rob Sher (Follies and Gypsy), the Grammy nominated soundtrack is a combination of music and monologue. Arrangements by Aaron Johnson and Antibalas. Chopteeth and Funk Ark in Virginia! 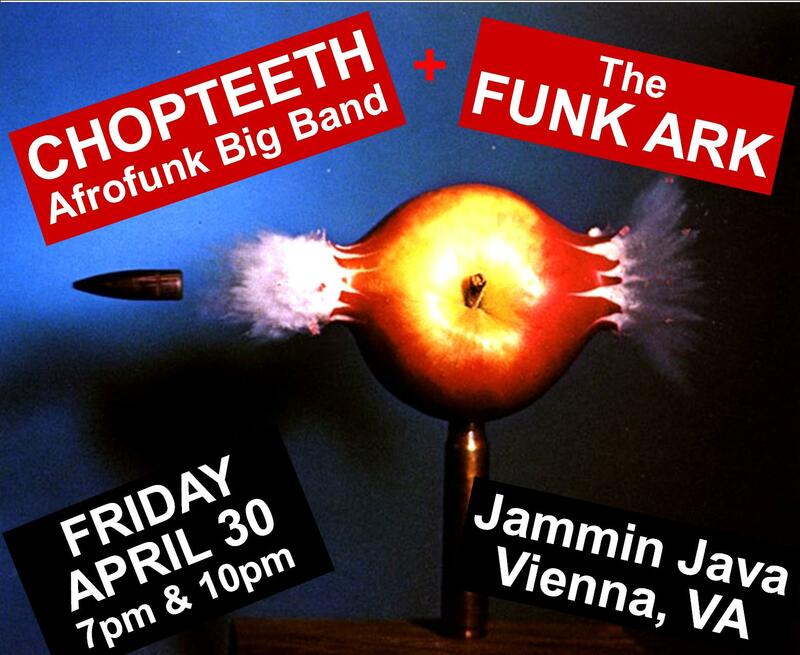 Great show tonight at Jammin Java outside of Washington, DC in Vienna, VA: Chopteeth and Funk Ark. If you're in the area, hope you can make it! Bassekou Kouyate and Ngoni Ba is a fantastic band that you need to hear now. 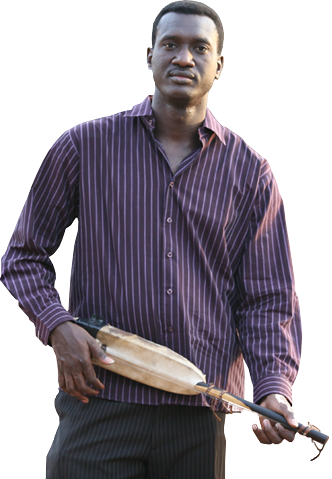 Bassekou Kouyate is a master of the ngoni, a small, traditional plucked lute with a big place in Malian history and a rich, deep sound. Bassekou is also the master bandleader of Ngoni Ba, an insanely talented group of four ngoni players (including Bassekou and two of his brothers), each with an ngoni of different size, shape and sound. The music is hauntingly beautiful and downright bluesy. Their debut album, Segu Blue, is surprisingly powerful, capturing the sparse majesty of the Niger River in Mali and demonstrating the full potential of this magic little instrument. Their latest release, I Speak Fula, sets the bar even higher. With performances from Toumani Diabate, Vieux Farka Toure, and Kassy Mady, this is a must have if you have any interest in African blues. 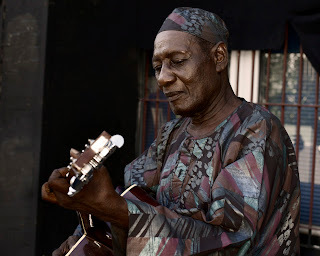 Bassekou has done stellar work for many years, on many albums, with Toumani Diabate, Ali Farka Toure, Oumou Sangare, Taj Mahal and Bela Fleck. So I've long known about his artistry on the ngoni. But with his own group he gets to show how talented a composer and arranger he is. The music is traditional, yet it's forward-thinking. But the albums could not prepare me for the live show. Endless funky jamming that had the crowd moving from start to finish, with Bassekou setting the groove and none other than Taj Mahal in the first row right next to me, dancing, singing, and yelling with joy. At one point Bassekou was explaining to the crowd what an ngoni was, and Taj yelled out "It's the African banjo!" It was a great night and the level of energy and musicianship was unparalleled. I'm already craving the next release, the next tour. Bassekou Kouyate & Ngoni Ba. Wow. Whoever thought theater would be the savior of Afrobeat music? 100-plus afrobeat bands have been pounding away in relative obscurity for the last 15 years or so, delighting only the privileged few with the secret knowledge of Baba Kuti’s unique groove. Then along comes the powerful Broadway play, “Fela!” attracting an impressive pop following and critical acclaim, educating thousands about Afrobeat and “Felasophy.” Awesome. It’s powerful when your girlfriend’s 64 year old mother asks you to borrow some Fela CD’s. 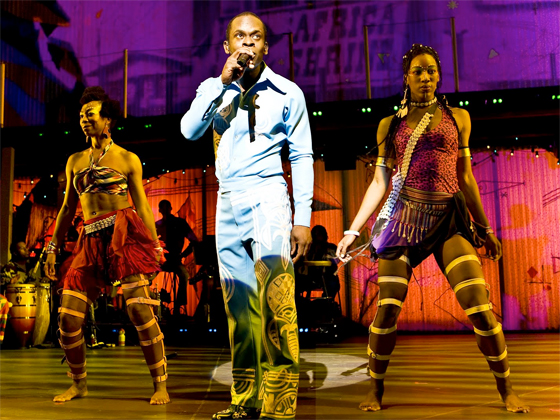 No doubt in great thanks to “Fela!” on Broadway’s success, now Afrobeat fans will be treated to another miracle, a Fela Hollywood film! 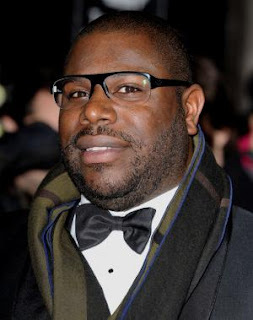 Focus Features has hired British director Steve McQueen (“Hunger”) to direct, ad co-write the script with the award-winning, Nigeria-born playwright Biyi Bandele (adaptation of Chinua Achebe’s, “Things Fall Apart”/ Shakespeare Theater Co.). "Fela might be the most globally influential pop artist outside the Beatles in the last 50 years," Focus Features’ James Schamus told Variety. The Afrobeat Renaissance continues to flourish in the US. A new 13 piece afrobeat band based out of Brooklyn called Zongo Junction is hosting a monthly party called "Afro Funky" dedicated to afrobeat, funk and soul. The parties started in July at Public Assembly but are moving to a new venue. The nights are expected to grow as time goes on. The next show is in Williamsburg (at the Cameo Gallery, a new music venue behind the lovin cup cafe on N 6th between Berry and Wythe). Participating bands are all based out of Brooklyn, and Williamburg in particular ( including Ikebe Shakedown, Sister Sparrow & The Dirty Birds, No Small Money Brass Band, Meta & The Cornerstones). Very Brooklyn-centric! This should be a fabulous show in one of the best clubs in the country for Afrobeat! 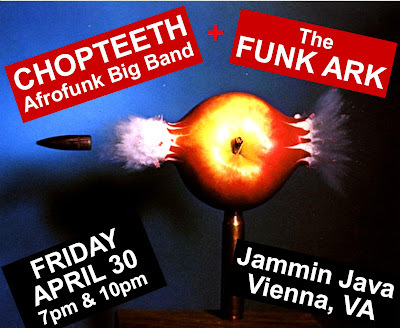 Chopteeth Afrofunk Big Band with DJ Jahsonic!